Kielbasa has long been a favorite sausage for meals and appetizers, and it's an excellent protein choice for the crock pot. Kielbasa is sometimes called Polish sausage, and it is available in most grocery stores. Smoked kielbasa is the most common variety, and available in most markets. You might find uncured and fresh kielbasa in stores that specialize in Polish or Eastern European food. 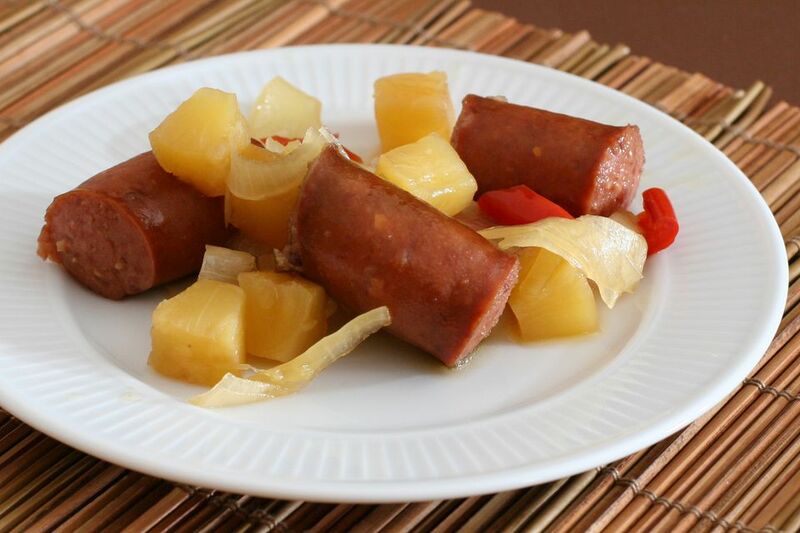 This is a simple and budget-friendly recipe for kielbasa, slow cooked with pineapple chunks and a tangy vinegar and brown sugar sauce. Use smoked (or uncured) pork, turkey, or beef kielbasa in this recipe. Feel free to add about 1/2 cup of thinly sliced carrot or chunks of celery to the slow cooker along with the bell pepper. Or cut up an extra red or orange bell pepper. For a spicier sauce mixture, add a teaspoon or more of Asian chili sauce ( sambal oelek) or add a small minced hot chili pepper. Serve the kielbasa, pineapple, and vegetables with hot boiled rice. Add a side of Asian slaw for a fabulous dinner. Place a sieve or colander over a bowl and drain the sausage, reserving the juice. Put the pineapple chunks in the slow cooker and set the juice aside. Cut kielbasa into 1-inch to 2-inch lengths. Peel the onion and cut it into quarters. Cut the onion quarters crosswise into 1/4-inch slices. Cut the bell pepper into 1-inch chunks. Add the kielbasa pieces to the slow cooker along with the onion and bell pepper. To the bowl with the reserved juice, add the cornstarch and stir the mixture until smooth. Add the vinegar, soy sauce, and brown sugar; stir to blend. Pour the juice mixture over the kielbasa. Some suitable substitutes for kielbasa include smoked Spanish chorizo, spicy andouille sausage, linguisa, or linguica. Or make the recipe with hot dogs, gourmet smoked sausage, or brats. For appetizer servings, thread chunks of kielbasa, pineapple, onion, and bell pepper onto toothpicks or small skewers. Add the skewered sausage appetizers to the slow cooker with the sauce and cook as directed. Offer guests plates and napkins and serve the appetizers hot from the crockpot. The dish is a good one to take along to a potluck dinner or tailgating party. Just cook the kielbasa as directed and then wrap the crock pot in newspapers or blankets to keep it hot while transporting. Plug the crock pot in when you get to the party or dinner.